The High Resolution Thickness Monitor and Thickness Controller are based on the principle that the oscillating frequency of a quartz crystal is changed by the mass of a deposited film on its upper face. Electronically measuring this effect allows for a determination of the thickness of a deposited film. Once the density of the evaporated material is entered into the system, the thickness is measured to a resolution of 0.1nm on a four digit LED display having a range of 0-999.9 nanometers. 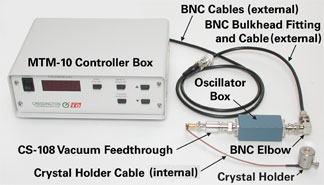 The crystal and holder are mounted in the vacuum chamber and connected to the FTM Power Supply via the supplied vacuum feedthrough. Accurate manual control of film thicknesses during deposition is difficult if not impossible. A white tile with a drop of oil is sometimes used for rough estimates of coating thicknesses of carbon but cannot be used when repetitious, reproducible coatings are required. Using instrumental settings is also not an accurate method because vacuum level (for sputtering) and time (for evaporation) are very critical parameters. The High Resolution Thickness Monitor offers repeatability of coating thicknesses, removes guesswork and is convenient. The use of a tooling factor allows for exact measurement of the thin films. The MTM-10 High Resolution Thickness Monitor will fit any of the Cressington sputter and carbon coating systems. 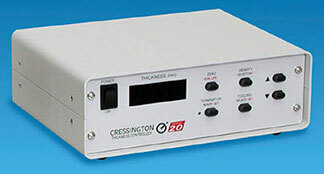 The MTM-20 High Resolution Thickness Controller is specifically designed for the Cressington sputter coater systems and is fully compatible with the 108auto, 108auto/SE, and 208HR sputter coater systems. Vacuum Feedthrough: CS-108; Diameter 10mm up to a plate/flange thickness of 9mm.